Make your brace as good as new with this replacement kit. Includes everything you need to refurbish your brace. Parts are easy to replace yourself. 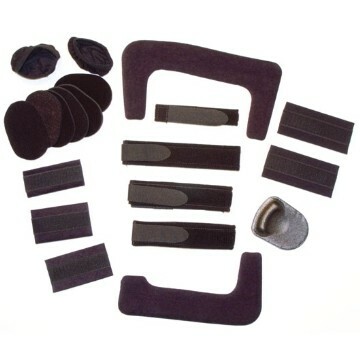 This Kit includes: STRAPS, PADS, LINERS, CONDYLE KIT, SUPRA CONDYLAR PAD. Armor CI includes extra front thigh strap. Wondering if the replacement straps can be covered under insurance? It would depend on your insurance provider. You can call 800-548-3370 for insurance related orders. I need the standard calf replacement pads but all I see is the short. Where do I order the standard? Unfortunately, we don't carry the standard calf replacement kit. You will need to go directly through DJO Global. Please call 800.336.6569 for assistance with ordering. I need a pad and strap set for a Armor ACL XXL w/fourcepoint hinge I'm hung up on the pic of parts, the wrap around the thigh pad for mine does not look like that one it looks like the female parts pic. I know the pic is probably generic but I don't want to order the wrong thing. Is there any way to get replacement velcro? My velcro that holds the pads in place around the knee was ripped off. Do the straps come with the metal hinges that are attached to the brace? If not, is there any way to get them? Thanks! I happen to know there is a short calf and long calf version of my brace.. Is there a way I specify my brace is the "long calf"? Where can I find an indication of size on my Armor FourcePoint? I got it many years ago and no longer have any of the materials it came with (box/manual). It has a number on the inside top of the brace (on left hand corner of left ACL model brace). The number is 110902 or 110962), does this help at all with determining what size this brace is? Also, the top swiveling strap tab is quite bent, do you offer replacements for these as well? I am looking to purchase the Replacement Kit, Knee and Shin Protector, and possibly another FourcePoint for my right leg, so would like to get the sizing right before I put in my order(s). The picture of the pad kit doesn't look like it would fit my Armor FourcePoint. Mine has the angled bar across the top of the thigh, not the horizontal bar. Is the picture the exact product that I'll be getting or is there a kit that is made to specifically fit the angled version of the brace? 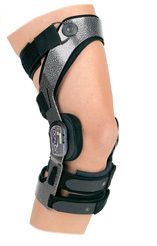 Every DonJoy Armor features a "Swooping Thigh" on the medial or interior side of the brace. This item will fit your DonJoy Armoras long as the options selected match your DonJoy Armor brace configuration. After 10 years, nice to have new straps. This set was great because I must use the brace longer than just rehab time and the pads needed to be replaced. The only reason I didn't give the full 5 stars is because they weren't labeled for easy placement (I had stripped the old ones without thinking of the need for visual comparison!). I went into my rehab place and the "brace guy" took care of me! BetterBraces.com girls are great to deal with!